Mr. P was found as a stray during the Moses Lake Washington fires in August of 2016. 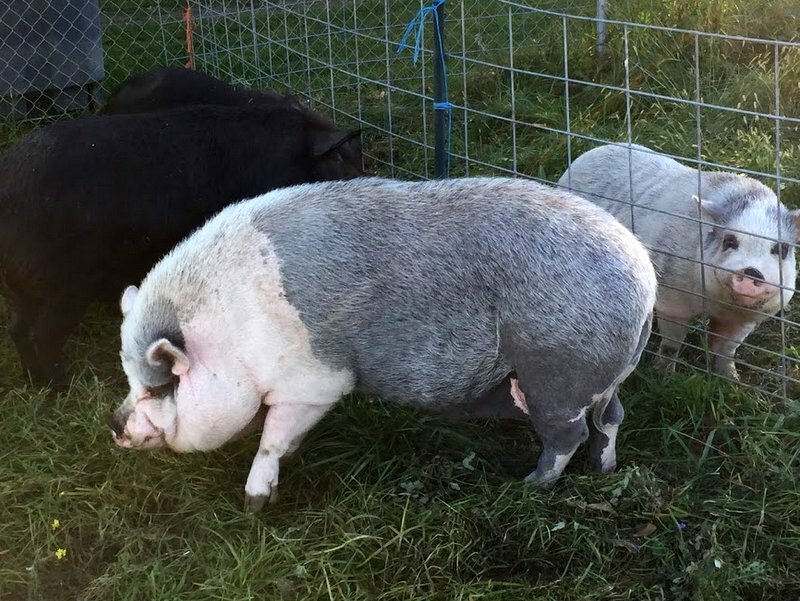 No one came forward for this breeder boar, the only adoption offers were to make him into “sausage”. The rescuers found him to be good natured, and they could not see him sent to slaughter. They described him as a 600lb lap dog. He got along with everyone. The rescuers wanted to find a forever home for him. He lived in a dog run at the Moses Lake Humane Society for 3 months until they found us.We offered to bring him here to the sanctuary. The rescue had his tusks trimmed, and had him neutered before he came to use in October. Even though he had signs of medical neglect- tusks growing into his cheeks and snout, mange, mites, and pig lice, he is indeed a loving and trusting giant. He is about 3 ft tall, 7.5 feet long and around 900 lbs! We renamed him Mr. P (we didn’t like Mr. Porker). He is a favorite among visitors, who often gasp at his large size. Most people have not seen a full grown pig before. Passersby will slow down, and sometimes get out and take photos from the road. 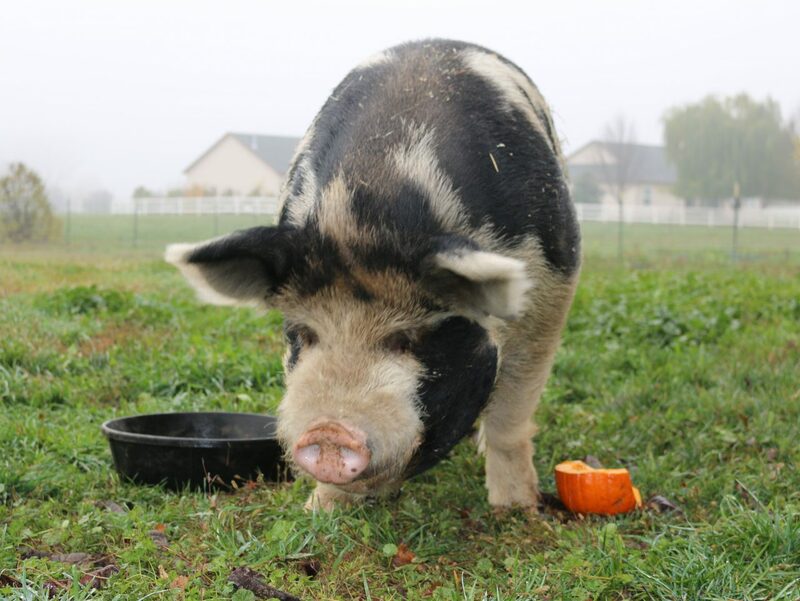 Mr. P is a great mascot for sanctuary, he helps people realize just how misunderstood pigs are. 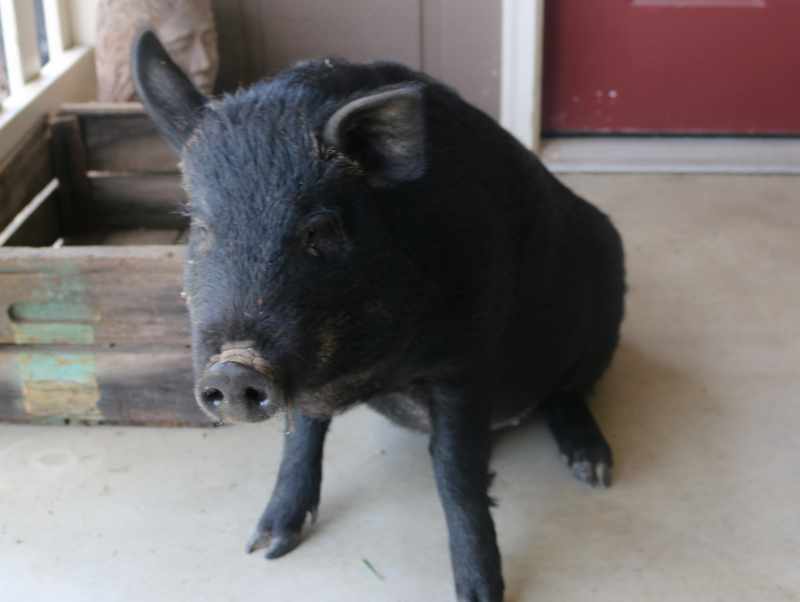 Onyx was purchased as a “mini” pig in Florida. He was surrendered at 4 months old to River’s Wish Sanctuary by his owner. She was frantic to find him a home before she was evicted from her apartment. She had moved to Spokane and was not aware pigs are not allowed in the city. We adopted him. He was our first pig. He was bullish and bossy, yet sweet and affectionate. He loved his pack of dogs and played chase around the yard with them. He slowly became paralyzed in his right front leg at 10 months due to an unknown cause. His back legs also continued to weaken. But Onyx is resilient. He has taught us to never give up. At one point he was falling over every few minutes with his weak legs and we just didn’t know if we could let him go on like that. All of a sudden he learned how to right himself by rocking his body, and then changed his stance and walking to accomodate his changed balance so he rarely fell. Onyx is a very intelligent pig. He learns very quickly, and knows how to communicate his needs to us. He loves to snuggle his head on Michelle’s lap, and we cherish whatever time he has left in his ever weakening body. Hammy is a senior pot belly “mini” pig. He came from Pigs Peace Sanctuary as a companion to Onyx. He is also handicapped and made a good friend for Onyx. We aren’t sure the whole story but we think he was attacked by dogs when he was young, causing scarring and deformation in his front legs. Over time this damage compromised his gait and led to severe arthritis in his back. People don’t realize that pigs can get hurt by dogs, even if they are best friends. Pigs and dogs should never be left alone together. Hammy and Onyx live together in the special needs area. They used to snuggle together every night. Pigs are a lot like people; sometimes they quarrel, and Hammy and Onyx had a falling out. Hammy decided to start sleeping in another hut. We wish they would still snuggle together especially on cold nights. 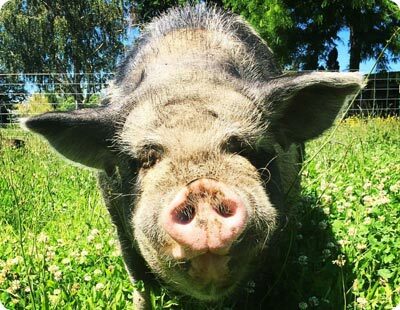 Pigs are very choosy about who they spend time with, and we can’t make friends for them! Hammy loves people, and will fall over for a belly rubs. He is very vocal when he thinks it’s feeding time. He will greet visitors, although he will grumble loudly and walk off when he’s had enough attention. Tidbit came to the sanctuary in October, 2016. His previous family was told he would be no more than 25 pounds. He came to us over 300lbs! Breeders often tell people that “mini, micro or teacup” piglets will be as small as the parents. What they don’t tell you is that the parents are not full grown themselves! Sometimes they will even give instructions to underfeed a pig to keep them small. This results in an emaciated, very sick, stunted pig. 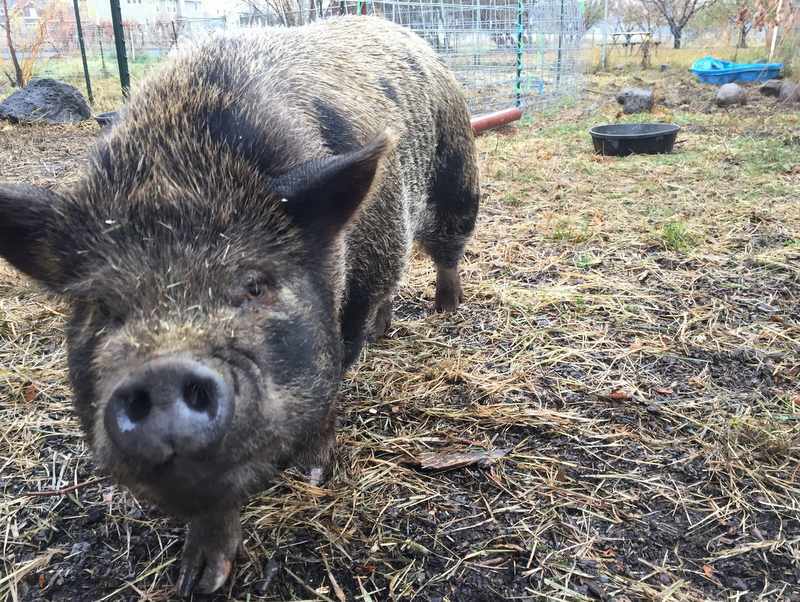 Tidbit was surrendered to us because he outgrew trailer living, and had “Spoiled Pig Syndrome” (yes, that’s a real thing). His family loved and cared for him very much. It was very hard for them bring him here but he believed he was top pig, chased his human family around swiping, and biting at them. 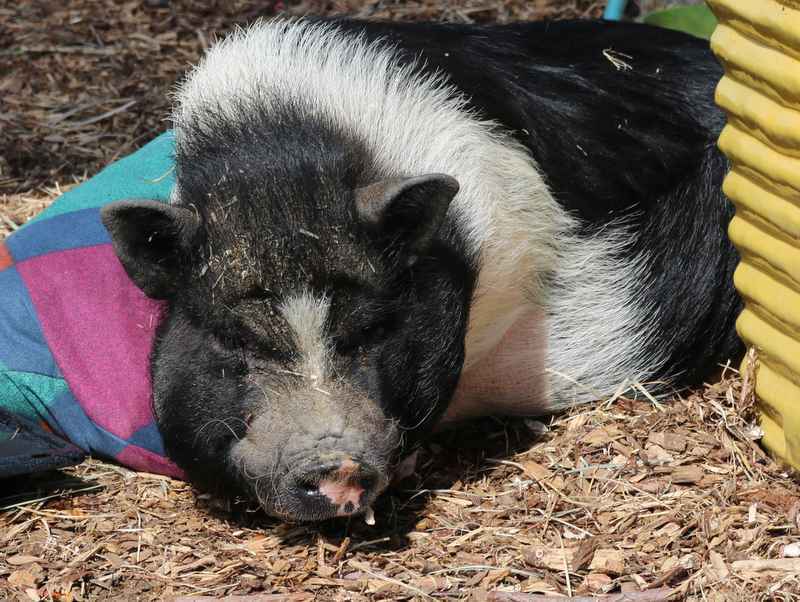 He was a bored house pig without room to roam, fed too many treats, and became unhealthily obese. When he came to the sanctuary he was considered fat blind, which made him fearful of people and situations he was unfamiliar with. 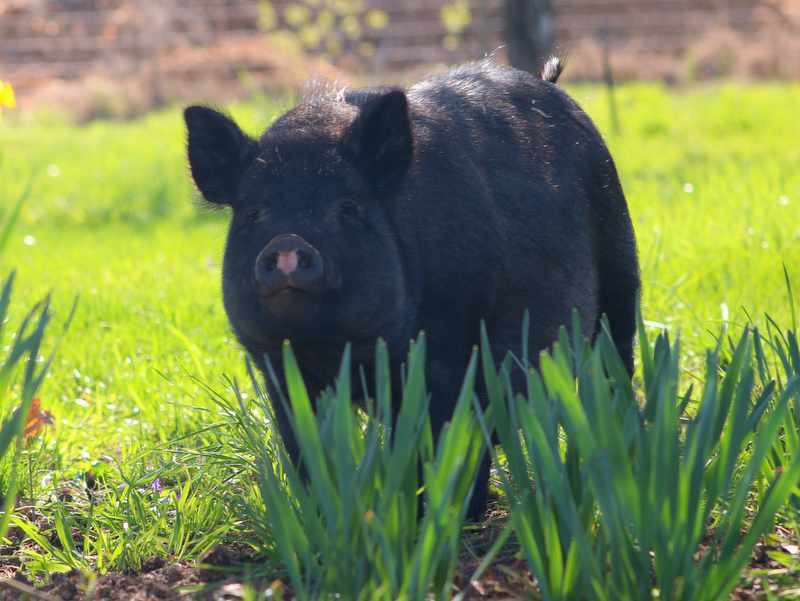 He is adjusting well to outdoor pig life, on a strict diet of pasture grass and seasonal vegetables. He has lost 80lbs with about 40 more to go. His behavior has improved, although he still in not trusting of new people and men. He will continue to improve to as he lives with other pigs and learns to be a pig. Mitzy came to the sanctuary December of 2016. We received a call from Grant County Animal Control late evening that two pot belly pigs were left in a shed without food or bedding. It was approaching 10 degrees that night with predicted snow and ice. The next morning we hitched up the trailer and drove to Ritzville on icy roads to rescue her and her sis. Catching them was a challenge. The two pigs were about 18 months old when they came to the sanctuary. They were very afraid of us, especially her sister Minnie, as they not been handled much by people. Mitzy took good care of her smaller sister often grooming her keeping a close eye. Heartbreakingly, her sister passed away during a routine spay surgery. Mitzy was with her until the end. Because she saw her pass, she was able to move forward. (Pigs will mourn a very long time over the death of their loved ones, especially if they do not get to see their passing.) We are hoping that one day one of the pigs we bring in becomes her new friend. Mitzy is a very vocal girl, talking to us continually with pig talk and giving us pig kisses (a huffing sound they make). It took over a year for us to build enough trust for her to accept scratches and a belly rub from us. She has a white stripe on her forehead and white “socks” on all her feet. Abby came to us in late winter 2017. We’re not sure what kind of pig she is- maybe a domestic farm pig and pot belly cross, but is much, much larger than the “mini pig” she was advertised as. (There are no such thing as teacup or mini pigs!) She was bounced from Craiglist ad to Craigslist ad, finally being brought to River’s Wish Sanctuary in Spokane, where she met Blitz, her bestie. They were both transferred here together as 8 month olds. They quite small, around 40lbs. Who would believe that they are now close to 200lbs? Abby is one of those pigs that works their way into your heart deeper than you imagine possible. She is very affectionate, and loves hanging out with people. She’s always ready for a belly rub. 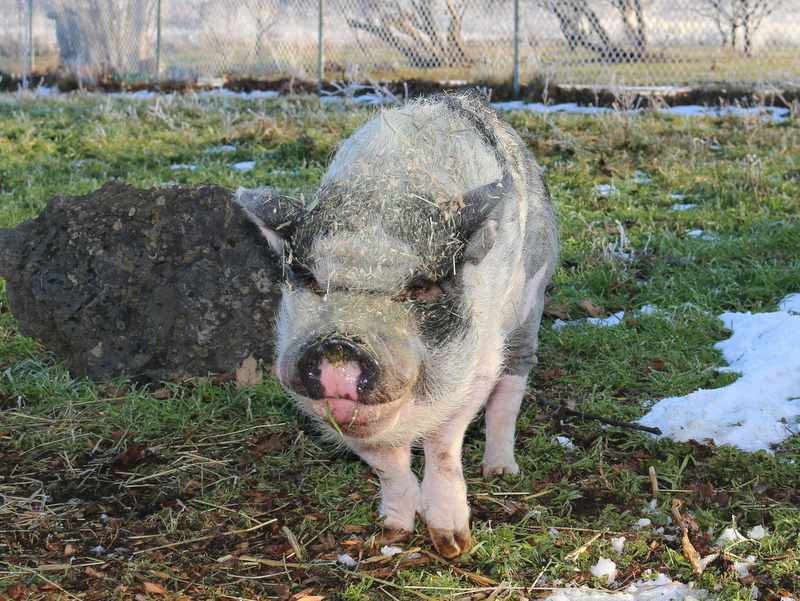 Abby is a gentle girl, preferring to be a peacemaker over challenging the other pigs. When Tidbit and Sonny were first introduced, they fought often. Abby and Blitz both surrounded Sonny and nudged him away from Tidbit. She then gave him a belly rub with her snout! Another time Mr. P was challenging the baby pig Bugsy at the fence, Abby laid up against the fence blocking Mr. P from getting close to Bugsy. She is silly, fun, playful, and at times a curious troublemaker. She loves snuggling with Blitz and Sonny. Blitz arrived in late winter 2017 along with Abby. He was 8 months old, living in a small dog cage, under a heat lamp in a garage. He was surrendered to River’s Wish Sanctuary, where he bonded with Abby, and they both came to live with us. They are the BEST of friends. Although he was originally sold as a “mini” pig, he is probably around 180 lbs now, and won’t be full grown until 5 years old. He is living proof that mini pigs are not mini, just considerably smaller than a domestic farm pig. His main focus in life is rooting and grazing for food but he also loves to snuggle, and get belly rubs. 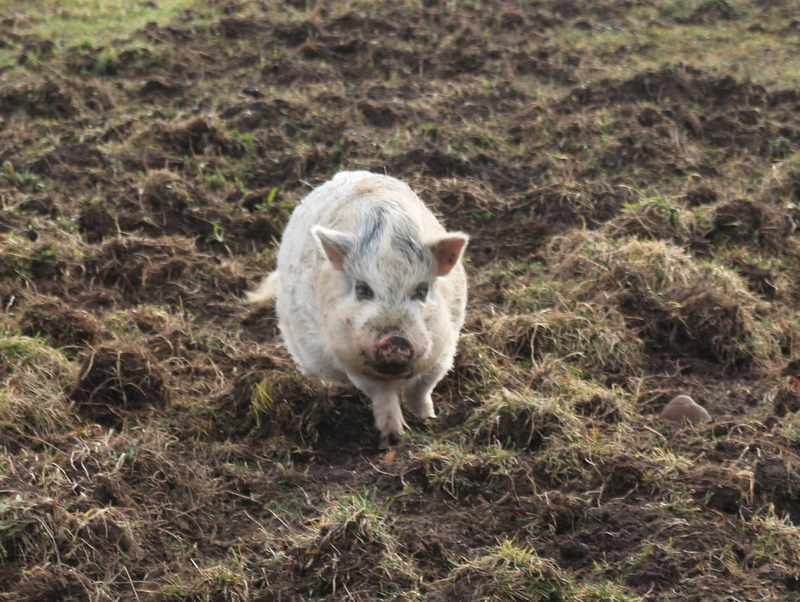 He is an easy going, delightful pig, He likes to keep the peace, often getting between quarreling pigs. We are so very lucky to have him here. He will greet you when you come to visit! You can recognize him by the pink heart on his nose. 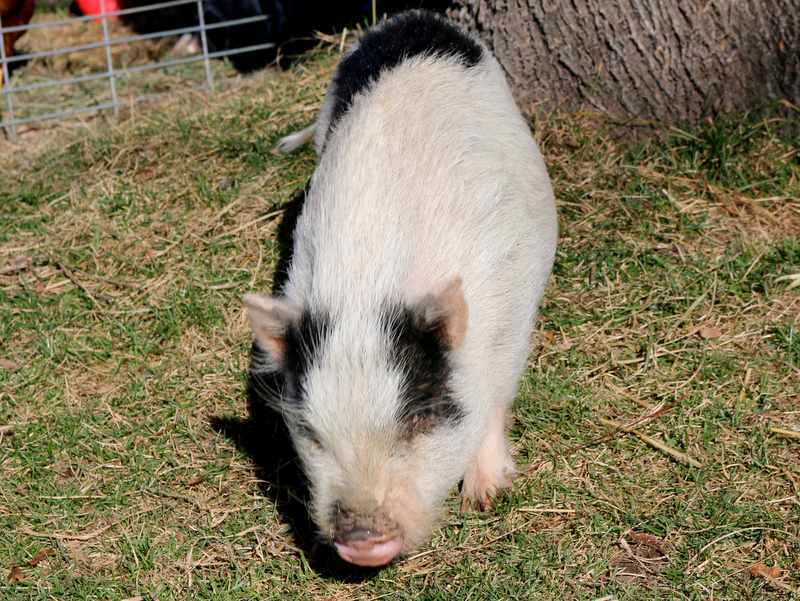 Frances is a mini pig that was used for breeding. When she was no longer wanted for breeding, she was scheduled to be sent to slaughter for meat. She lived in a tiny dirt pen in her own feces, and very little shelter. Her son, Sonny, was in the pen next to hers, but because he wasn’t neutered he wasn’t allowed to be in with his mother. Frances came to the sanctuary September 23rd, 2017. The first thing she did was to take a bath in the kiddie pool to clean and cool herself. 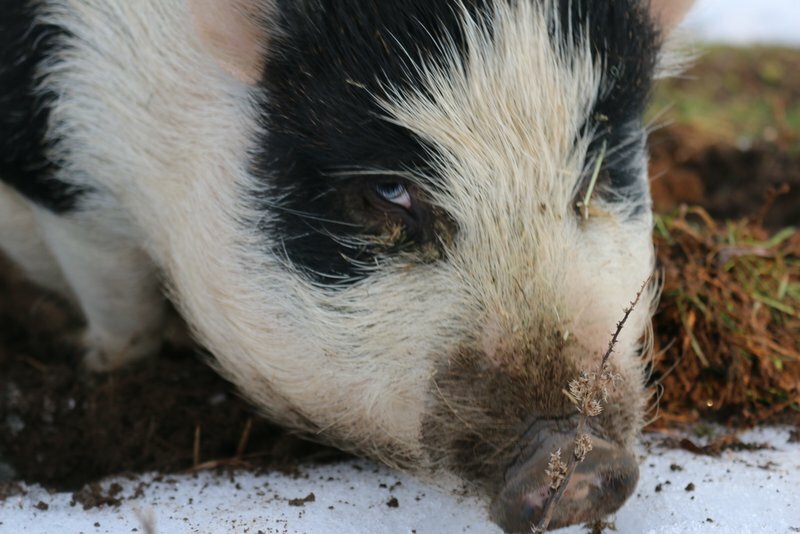 She is a very trusting and affectionate pig once she gets to know you. She will even let you give her a belly rub. She spends her days grazing and lounging in her deep hay bed. Now that she is spayed and her son is neutered they are always together. She will never have to live in squalor, or be at risk for the slaughterhouse. Frances is our only cinnamon colored pig. She has black spots and gold eyes. Sonny is Frances’ son. He was used as a breeding boar to breed “mini” pigs. Once the breeders decided to stop breeding pigs, he and his mother were slated for the slaughterhouse. 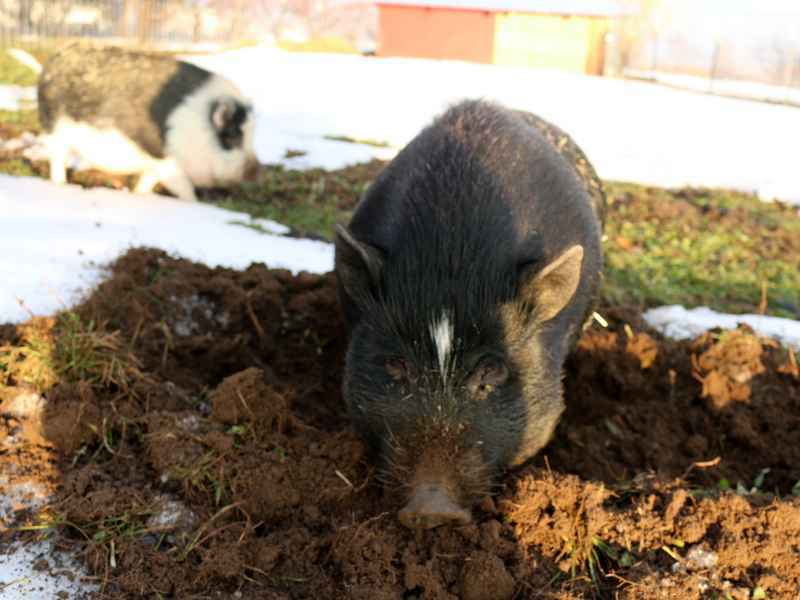 Sonny had never been socialized to people, he lived in a small pen in his own feces and a dead pig carcass. Sonny has come a long way since being rescued. He was neutered, had his tusks trimmed, and became the top mini pig for awhile, even though he is 1/2 the size of the other mini pigs! Tidbit has since reclaimed the top mini pig spot. (Of course Mr. P is the top pig of all.) He allowed his first belly rub 5 months after coming to the sanctuary. He has become friends with Abby and Blitz, allowing Abby to give him snout to belly rubs. His most favorite thing is to eat hay while laying in his hay bed. You will recognize Sonny by his short stocky stature and his gorgeous gold eyes, thickly outlined in black. Bugsy is the latest addition to our pig family. He was dropped off as a stray at a shelter in Boise, Idaho. Bugsy was only 5 months old and only had three legs! He was not neutered and had a a terrible case of mange. Because Bugsy is young and has only three legs he resides within the handcapped pig area. He gets around really well, even running on three legs. He will never be able to be in the main pasture as he could be easily injured by the larger pigs. So far he is considered a nuisance by Onyx and Hammy. We hope eventually one of them lets him be their friend. When Bugsy first arrived he would run from us. Now he allows us to give him scratches and has been tempted to fall over for a belly rub. We are not sure if Bugsy will need a prosthetic leg or cart as he gets older. We hope he is a smaller pig, as that will be easier on his remaining back leg long term and he may not need assistance.